The F&D T60X tower speakers are sleek, trendy, classic and designed for the ultimate acoustic sound. It includes a 3-way acoustic design and a 1-inch dome tweeter, making it ideal for a home theatre experience. You may also connect your device directly to the speakers as the Bluetooth and NFC allows you to seamlessly stream your music. Easily pair and play your tracks on these tower speakers by F&D. With a silk dome tweeter, 4-inch woofer and 8-inch subwoofer, these speakers by F&D give you a powerful acoustic sound output. Made from high quality wood, the housing produces a natural and powerful sound. Place it in a living room or a home theatre for an ideal movie watching experience as it is compatible with DVD, TV and mobile devices. It also provides connectivity with USB, AUX and Bluetooth. 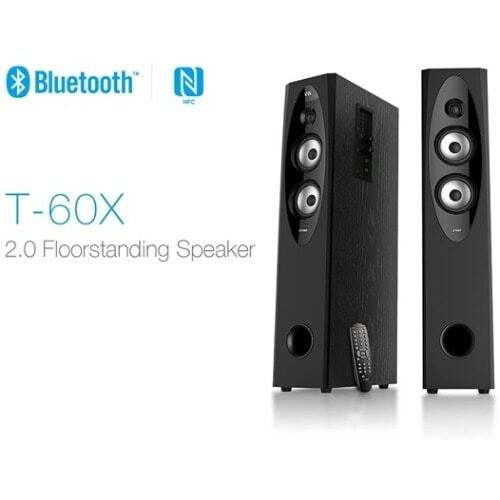 Play your favourite music directly from your mobile device on the F&D T60X tower speakers.